Make a mural for THE EASTER EGG.. All you need is a large sheet of mural paper about 3 feet by 6 feet and paints or crayons. Click on the small pictures to download the full sized artwork, or click on the link below each picture for the PDF version. 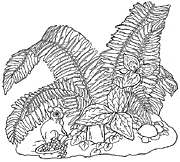 Then color, cut out the images and paste to the mural. Print as many copies as you wish. 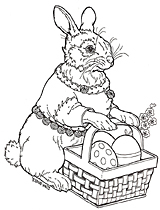 The Easter Rabbit is a large pure white bunny with pink eyes. The pupil, usually black, is deep maroon. In this picture, he is admiring one of the rabbit town bunny's beautiful eggs. I chose the New England Giant breed to model the Easter Rabbit after because of its large size and regal bearing. Hoppi has found a trio of beautiful eggs, and to top it off, he has also supplied a baby chick. Perhaps it will grow up to be like the magnificent coaching chickens that pull the Easter rabbits Wagoneer. Hans Vanderabbit, a hayana rabbit is bringing his portrait egg to the glenn where the Easter Bunny will choose the best egg. 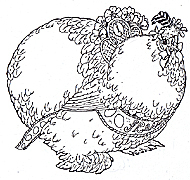 Beside him is a himalayan rabbit, Granny Ireney, who is carrying her pysanky egg that she has designed to show a hedgehog. 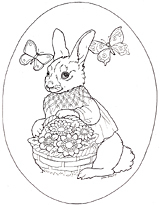 One of aunt Sassafras's daughters, is a lop, a rabbit with ears that flowed down toward the shoulders. She is hoping the Easter Bunny will like her chocolate frosting, edible egg. Copy several of this design and be amazed how different it looks with different color combinations. 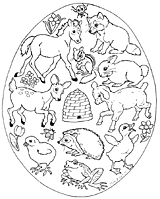 Color a fox "kit, a ladybug, a horse "foal, a chipmunk, a rabbit, a deer "fawn", a sheep "lamb", a duck "duckling", a hedgehog, a chicken "chick", a bee, and a frog. Practice your shading on this bunny, making her white with pink eyes, a very beautiful color combo for pet bunnies. The rabbits bring their eggs to the Glenn and put them in the egg pavilion. They are all ready to be loaded onto the Easter Bunny's wagon. The pavilion is empty now, waiting to be filled with eggs. beautiful eggs to paste inside. The rabbit's bring their eggs to the glen and put them in the Egg Pavilion. They are all ready to be loaded onto the Easter Bunny's wagon. The pavilion is empty now, waiting to be filled with eggs. 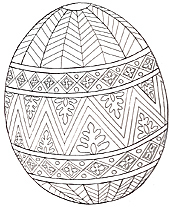 If you are handy with a copier, enlarge the pavilion and ask young artists to create beautiful eggs to paste inside. You will find a second version on this page without the eggs. Egg designs to cut out and paste in the pavilion or in the wagon. Use gel pens, metallic gel pens, and glitter pens for shine and sparkle. A copier can be used to reduce or enlarge settings for a variety of sizes. More eggs for the big day. Use your copier to resize them, and cut them out to decorate your mural. Leafy tree top. I've designed the tree top to be copied multiple times, to create a full top, or used singly to form a simple top. Use light green and yellow greens on the smaller leaves to create spring-like foliage. Two gray squirrels chase each other through the trees. This page is meant to be stacked with the three other tree pages. The top is the leafy top of the tree, the next down is the upper section, it shows the squirrels. The lower section is the robins nest, under that is the tree bottom. Which has the roots and base of the tree. A sign of spring, father Robin is singing, "Cheer-up", cheer-up", while mother Robin sits on her blue-green eggs. The color is so distinctive that paint companies have a color called "robin's egg blue". Mother Robin will sit on her eggs for over two weeks while the baby birds inside grow until they are big enough to hatch. This page can be stacked with the other three tree pages. This page is meant to be stacked with the three other tree pages. It goes on the bottom. to create a variety. You can also use the second option that I've provided. Use this artwork to fill in around your great rabbits! 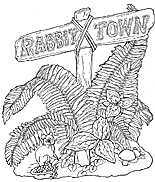 Roberto Rabbit is a Rex, known for its velvety coat. He is an inventor, and carries a wrench in the toolbox in case he needs to fix the parts on the intricate mechanical egg he created. She is carrying a basket of flowers called dahlias, that come in shades of pink, orange, red, yellow, and purple. and Australia. He is wearing his lab coat for this coloring page. come in many colors, blue-gray, white; golden would be fun to color. This little bunny named Madeline is Dutch, just like Lefty and Righty in my book .Dutch have a solid background colors such as black, dark brown, gray or tan. Their face has a blaze or stripe starting between their eyes that widens so the muzzle and chest are white. Their feet and tummies are white too! This is a Polish bunny inspired by "Basil" my young friends, Bethany's Polish bunny. It is a small rabbit with short ears, but has a large personality. Some colors I have viewed are black, Himalayan (white with gray black nose and tips of its ears), grey, and very beautiful, white with small black spots like a Dalmatian dog. She's a Dutch rabbit, a very popular breed. Her coat is either black, brown, or grey. She has a white blaze and muzzle. Under her clothes, her fur would continue in a dark and white color pattern. Her feet should be white. A third Cochin hen to color and put in front of the wagon. You may want to copy more than one. I left her breastplate blank, so you could fill in her name as well as her number which is on the top of her harness, just behind her neck. I made my Cochin buff, a golden red color, but Cochins come in Black, mottled (black with some feathers tipped with white), Partridge (brown feathers with black stripes), silver and gold laced, white or golden with each feather edge in white, or blue grey, to name a few. This is Rose, one of the buff cochin hens pulling the Easter rabbit's wagon. You may copy, white out her name then copy again to substitute a second name to create the six hens that pull the wagon. There will be a second version of Rose with her feet changed a bit in these pages. 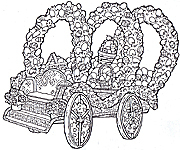 The Easter Rabbit's wagon is filled to brimming with egg and egg baskets. Even though swagging decorating it has eggs in it. The wheels have flowers woven through the spokes. The Easter rabbit's seat is purple, a color we all think of when it comes to Easter.